6 Inch Round Air Grille with Damper Discounts Apply ! Use this 6 inch round ceiling diffuser in any residential or commercial setting. Each white round diffuser comes with a durable powder coated finish and features step down diffuser rings. The 6 inch round ceiling diffuser step down rings effectively deflect air a full 360 degrees around the room. The white round diffuser includes a butterfly damper allowing you to adjust the air flow in each room. 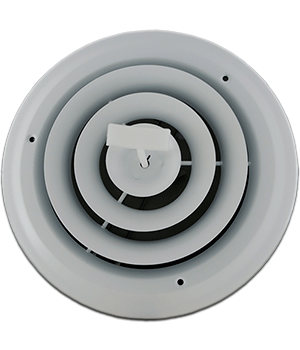 6 inch round ceiling diffusers are a cost effective way to update the look of your heating and cooling vents. White round diffusers will work with any decorating style. - Overall faceplate size measures 8 5/8"
***Hint: When ordering your 6 inch round ceiling register, industry standards ask that you measure using the actual duct hole opening dimensions and not your existing register's faceplate dimension. This round ceiling diffuser will fit a 6 inch hole opening. Don't need a 6 inch round ceiling diffuser with an adjustable damper but just a faceplate? Check out the 6 inch round return air grille. 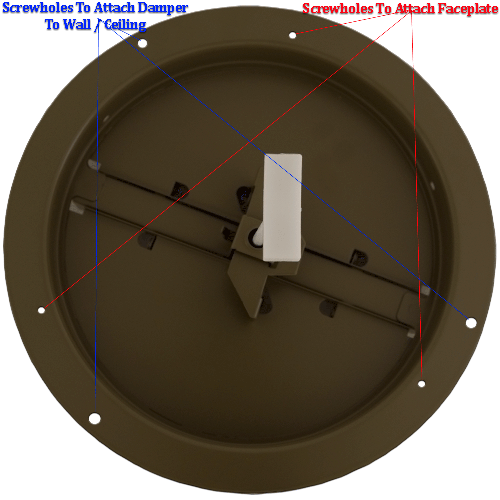 *** To install white round diffuser: Attach the damper to the ceiling with the smaller set of screws using the larger holes (Photo of Screwhole Placement). Once damper is in place, secure the vent to the ceiling / damper with the larger set of screws in the smaller holes. This 6 inch round ceiling diffuser is also available in sizes 8 inch, 10 inch, 12 inch and 14 inch. Check out our full line of round ceiling registers. White round diffusers can be difficult to find, order your today!